Belton Farm is situated just 20kms from Kenton-On-Sea and offers self catering accommodation in a unique 3 bedroom guest house with magnificent views of the undulating hills and Kariega River valley. Belton farm is situated in close proximity to the Sunshine Coast and Frontier Country, offering you the best of both worlds. 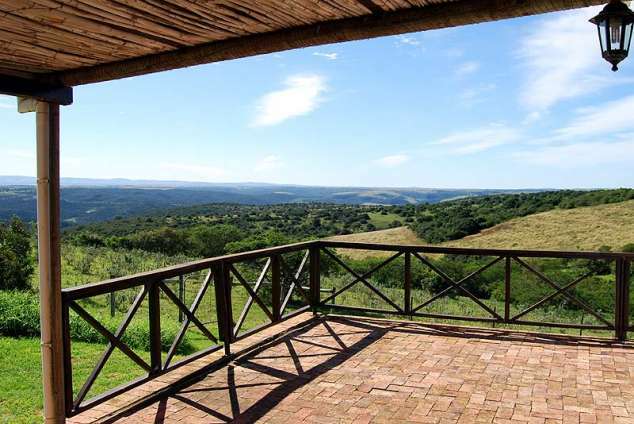 It is within easy distance to the beautiful beaches of Kenton-on-Sea, game lodges offering Big 5 game viewing as well as Bathurst and Salem towns rich in historical value. The cottage has the most wonderful views down into the valley, and if you are an early bird, what better than to watch the sunrise while having that first early morning 'cuppa' on the patio. Bird watching is most rewarding in this part of the Eastern Cape and you might be lucky enough to spot the colourful Knysna Loerie or even the Crowned, Martial and Fish eagles which breed in the area. Game Viewing: Right next door to Fish River, Bushmans Sands and Shamwari. Hiking Trails: Numerous trails of various lengths, maps are provided, or you can be accompanied if you would prefer. Belton is a good base to hike the many day trails in the area as well as the wonderful beaches to be walked and enjoyed. Bird Watching: Colourful Knysna Loerie, Crowned, Martial and Fish Eagles, bird watching is most rewarded in this part of the Eastern Cape. The area as a whole offers numerous action packed days if you want them. Canoes on the Bushmans River can be hired for the day or there is an overnight trail to be enjoyed. Horse riding at Kenton. The trail take you through indigenous milkwood forest to the beach and back. There are diving facilities at Port Alfred and of course river cruises up the Kowie and the Bushmans. Fishing in the area is also good, either in the rivers or deep sea. There are plenty of charters to be had and who better to take you out fishing, but the locals! The historic village of Salem with its 2 churches dating back to 1832. The toposcope at Bathurst which shows the directional position from where land was granted and occupied after 1820. The Bathurst Agricultural Museum, full of interesting agricultural machines. Nearby Rhodes University with it's fish studies and the coelacanth, restaurants, film theatre, camera obscurer which is well worth a visit, township tours and much more. Alexandria, just inland from Kenton, has the chicory factory where tours can be arranged. Maureen Quin resident sculptor, has a lovely gallery of work to be seen and offers tea while viewing. After which you can take the scenic drive through the forest and along the coast past many beautiful dairy farms. 27584 page views since 09 Dec, 2004.